1 Pack Per Box / 5 Cards Per Pack. INSIDE EVERY TIN: - (2) Autographed Patch Cards: - (1) Signed Rookie Patch card! - A second Signed Patch card, featuring a Collectible NHLer or great rookie in a collectible insert! 1 Signed Rookie Patch card! A second Signed Patch card, featuring a Collectible NHLer or great rookie in a collectible insert! 2 More Hits - Delivered amongst Signatures, Memorabilia or low-#'d parallels! THE CUP RUNNETH OVER WITH BIG-TIME HITS. Unquestionably, the Top Rookie Cards of the Season! Cup RC's - Nothing Better! The Standard of Cup Autograph Patch Cards! Now - for 1st time - all Rookies Feature GAME-WORN JERSEYS Too! Stick Nameplates - Awesome 1-of-1's! Notable Nameplates, with a Full Letter Patch right from a Game -Worn Jersey! Signature Renditions, and Combos Too! With Documentary-Style Images, Bringing Out the Passion of Hockey! NEW & UPGRADED HITS TOO. Look for a re-tooled Gold Spectrum Base Set Parallel! Veterans now limited to 5! Majority of cards now Autographed! Rookies are Signed and #'d to 25! Base Set Gold Auto Patches Re-Freshed Too! All cards, including Rookies, now #'d to 10! Find Red Foil Auto Tag Parallels to the Base Set! Showcasing Laundry Tags, and #'d to just 3! Black Foil Auto Variations Get a Lift Too! NEW - Autographed Legendary Gear! Giving these Amazing Hits a Legendary Twist! NEW - Black Foil Shield Logo Patches! These Base Set Variations are all 1-of-1's! Top Rookies, with Jumbo Patches and Autographs! Plus Top Active Superstars + Legends Too! Sure-Fire Mega-Hits that Exquisite is known for! PLUS - Exquisite Collection Art of the Game! Massive Hits with Hard-Signed Autographs to Boot! UPGRADE - Enshrinements now have a Slick Acetate Top Sheet! Featuring Signatures Directly on the Shimmering Surface! Featuring a Chrome NHL Shield Piece Embedded under Acetate! Nearly all of them are Autographed! Limited to 10 #'d copies per card! Autographed Rookie Patch Level 2 - #'d to 249. Autographed Rookie Patch Level 1 -- #'d to 99. Limited Logos, Tier 1 - #'d to 50. Limited Logos, Tier 2 - #'d to 25. Limited Logos, Tier 3 - #'d to 10. Emblems of Endorsement - #'d to 15. Autographed Rookie Gear Booklets - #'d to 25. Autographed Legendary Gear Booklets - #'d to 5. Dual Auto Rookie Bookmarks (Booklets) - #'d to 25. Dual Auto Legendary Bookmarks (Booklets) - #'d to 10. Autographed Draft Board & Patch Booklets - #'d to 10. Exquisite Collection Rookie Auto Patch - #'d to Jersey #. Signature Patches, Tier 1 - #'d to 99. Signature Patches, Tier 2 - #'d to 25. Dual Signature Patches, Tier 1 - #'d to 35. Dual Signature Patches, Tier 2 - #'d to 15. Honorable Numbers - #'d to jersey #. Dual Honorable Numbers - #'d to jersey #. Scripted Swatches - #'d to 35. Dual Scripted Swatches - #'d to 15. Autographed Cup Foundations Quadruple Patches - #'d to 5. Autographed Cup Foundations Tag Patches - #'d to 1. Autographed Monumental Patch Booklets - #'d up to 3. Autographed Monumental Rookie Patch Booklets - #'d to 5. Regular Card Gold Auto Patch - #'d to 10. Regular Card Red Auto Tag Patch variation some with Canadian Flag! - #'d to 1. Rookie Red Auto Tag - #'d to 3. Gold Auto Rookie Patches - #'d to 10. The Cup's Upper-Echelon Autograph & Memorabilia Inserts! Program of Excellence - #'d to 10. Program of Excellence Duals - #'d to 5. Program of Excellence Trios - #'d to 3. Autographed Rookie Draft Boards - #'d to 25. Exquisite Collection Art of the Game Booklets - #'d to 3. Exquisite Collection Base Set Veteran Autos - #'d to 25. NHL Glory - #'d to 10. NHL Glory Autos - #'d to 10. Scripted Sticks - #'d to 35. Dual Scripted Sticks - #'d to 15. Cup Enshrinements - #'d to up to 99. Cup Enshrinements Duos - #'d to up to 25. Cup Enshrinements Trios - #'d to up to 10. Cup Foundations Quadruple Jerseys - #'d to 25. Cup Foundations Quadruple Patches - #'d to 10. Autographed Cup Foundations Quadruple Jerseys - #'d to 15. Autographed Cup Foundations Sticks - #'d to 3. Regular Cards, Black NHL Shield Patch - #'d to 1. Rookies, Black NHL Shield Patch - #'d to 1. Notable Nameplates - #'d to Number of Letters in Last Name. 2005-06 Crosby Cup RC Tributes - #'d to 10. 2005-06 Ovechkin Cup RC Tributes - #'d to 5. Brilliance - inserted 1:4. Cup Trios (jerseys) - #'d to 25. Cup Quads (jerseys) - #'d to 10. Cup Trios Patch / / - #'d to 10. Cup Quads Patch / / - #'d to 5. Signature Renditions - inserted 1:4. Signature Renditions Combos - 1:36. Rookie Masterpiece (pressplates) - #'d to 1. Autographed Rookie Masterpiece (pressplates) - #'d to 1. 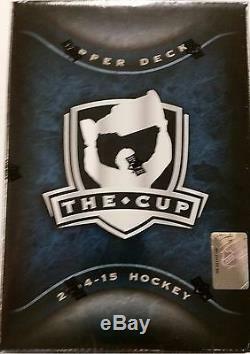 The Cup Masterpiece (pressplates) - #'d to 1. Artist Proof Redemptions for un-cut sheets! Regular Cards Gold Patch variation - #'d to 10. Regular Cards Gold Auto variation - #'d to 10. Rookie Cards Gold variation - #'d to 10. Rookie Cards Gold Auto variation - #'d to 10. Regular Cards Red Tag Patch variation some featuring Tag Patch with Canadian Flag! - #'d to 3. Regular Cards Red Auto variation - #'d to 3. Rookie Cards Red variation - #'d to 3. Rookie Cards Red Auto variation - #'d to 3. Regular Cards Gold Spectrum Auto variation - #'d to 5. Regular Cards Black Auto variation - #'d 1-of-1. Rookie Cards Gold Spectrum Auto variation - #'d to 25. Rookie Cards Black Auto variation - #'d 1-of-1. Rookies - #'d to 249. Rookie Autos - #'d to 249. Regular Cards Gold Spectrum / / - #'d to 5. Regular Cards Black / / - #'d to 1. Rookie Cards Gold Spectrum // - #'d to 25. Rookie Cards Black / / - #'d to 1. Regular Cards - #'d to 249. The item "2014-15 Upper Deck The Cup Hockey Factory Sealed Hobby 3 Box Case" is in sale since Tuesday, September 29, 2015. This item is in the category "Sports Mem, Cards & Fan Shop\Sports Trading Cards\Ice Hockey Cards". The seller is "sportscardsetcpgh" and is located in McKees Rocks, Pennsylvania. This item can be shipped worldwide.